It's all in the timing. 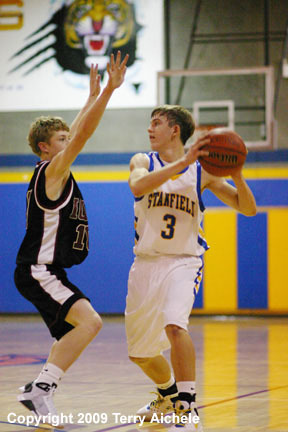 Stanfield's Robbie Shirley times his leap to control the ball in the opening tipoff. 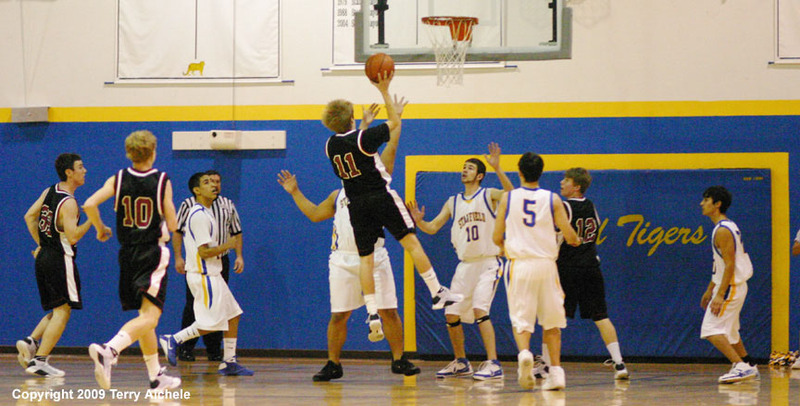 STANFIELD - The Stanfield Tigers defeated the Ione Cardinals 61-59 in overtime on Saturday, January 3, 2009. The Tigers took a 12 point lead in the first four minutes of the first period 14-2. Tyler Hawkins, Kameron Watson, Chase Erwert and Hector Esquivel had a big period hitting from the field and at the freethrow line. Stanfield lead at the end of the first 23-14. 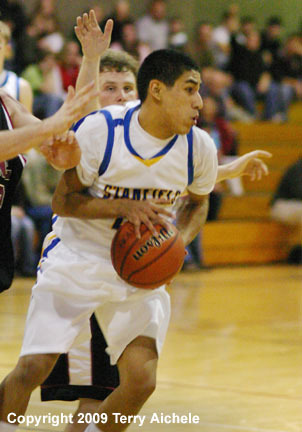 Stanfield outscored Ione 17-13 in the second period controlling the game and taking a 40-27 lead into halftime. Ione outscored Stanfield 21-10 in the third period closing within two points 48-50. 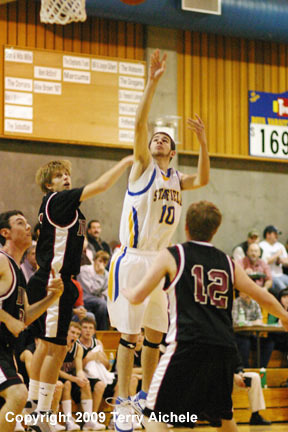 Ione then outscored Stanfield again in the fourth 9-7 to tie it at the end of regulation 57-57. Tiger Robbie Shirley hit two freethrows at 1:38 to tie it at 57 and send the game into overtime. Ione took the early 59-57 lead two minutes into the four minute overtime. 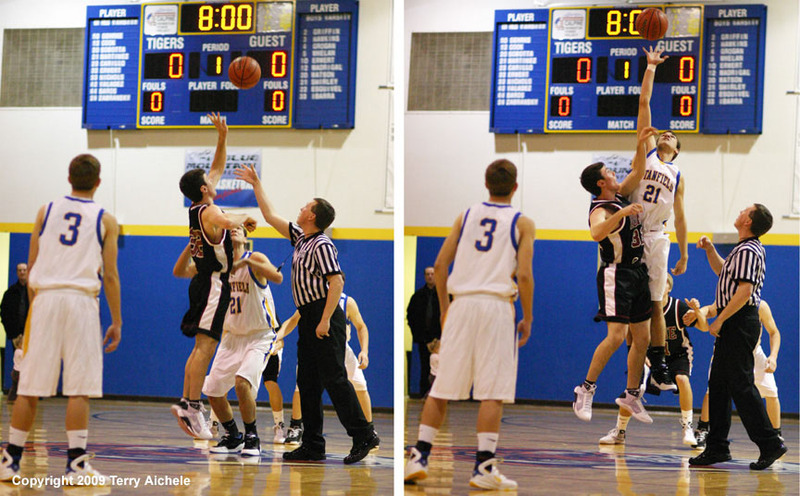 Tyler Hawkins then tied it up when he scored for the Tigers on a layup on a fast break. 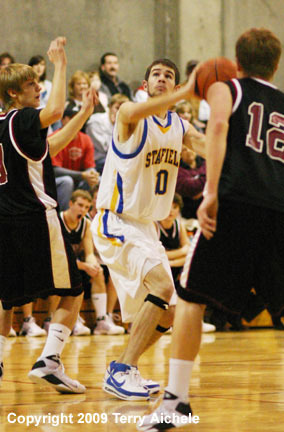 Then with 24 seconds to go Robbie Shirley of Stanfield scored a two point shot to give the Tigers the win. LEFT and RIGHT - Chase Erwert of Stanfield eyes the basket then takes the shot during the first half of the game with Ione on Saturday. 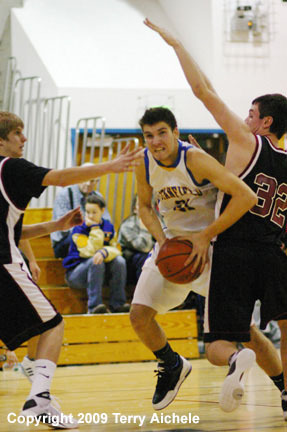 LEFT - Tyler Hawkins of Stanfield works his way around an Ione defender. RIGHT - Robbie Shirley of Stanfield squeezes his way through Ione defenders during the second half of the game on Saturday. 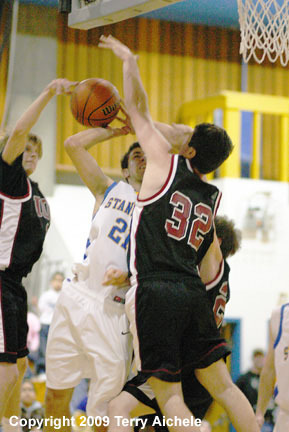 LEFT - Stanfield's Robbie Shirley gets doubleteamed by Ione defenders during the game on Saturday. 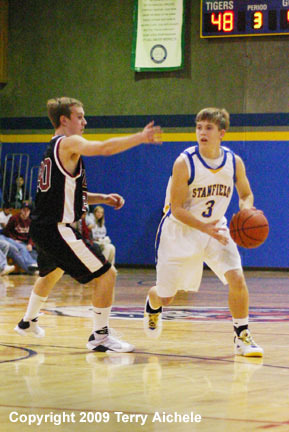 RIGHT - Tyler Hawkins of Stanfield looks for an open teammate to pass to.